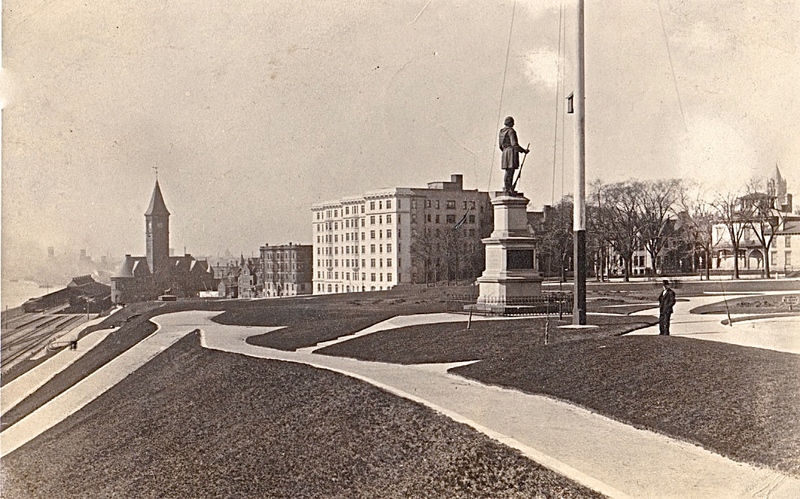 The Lakefront in 1911. Image courtesy of Jeff Beutner. Picture Milwaukee’s lakefront about a century ago. Elegant parks and fine buildings would come to mind. This photographic postcard dating from 1911 fits that bill. The Solomon Juneau statue is in the foreground and paved pathways in Juneau Park lead pedestrians down to Lake Michigan. The white building in the center is the Buena Vista apartments which would later expand and change its name to the Cudahy Towers. The tower of the beautiful Chicago & Northwestern Railway Lakefront Depot stands out to the left. The station, like the Milwaukee Road depot, would be demolished in the 1960s for an expressway that was never built. The depot’s destruction was soon lamented, and helped trigger the beginning of a historic preservation movement in Milwaukee which has grown since that time. By the 1970s the idea of a lakefront expressway — that would have destroyed Juneau Park — was abandoned, though the less intrusive Lake Parkway (I-794) was built. As lovely as this scene looks, Milwaukee’s lakefront was not always so beautiful or serene. This view is arguably the lakefront at its peak. The next few weeks will feature views dating from the 1860s and later showing major changes up through the 1920s on the lakefront. How much of lake front access was impeded by the railway at that time? One thing, I-794 is not the Lake Parkway and that is not downtown at all but south running from the south end of the Hoan Bridge to Pennsylvania at Edgerton by the airport. It is is Wis 794. I-794 of course runs along the southern edge of downtown and was to be connected to the Lake Freeway at the Lake Interchange north of the Hoan bridge. It was the Lake Freeway that would have run north through Juneau Park and connected with the Park (East) Freeway at the top of the bluff at Ogden and Prospect. @Bill… that’s a good question. The building is nice, but did the tracks come directly from the west? The railroad tracks cut south towards Walker’s Point, the bridge is still standing on the river although not in use… near Riverfront Pizza. As for the northern direction, they cut through the East Side in what is now the Oak Leaf trail. Does anyone have an idea of what the giant pole next to Juneau’s statue with what looks like a birdhouse on it could be? #5 Ben — That is a flagpole. I have seen it in other photographs of the era. Note also the cast iron fence surrounding the statue. I would like to see that replaced. The proposed lakefront expressway that would have destroyed Juneau Park and the downtown lakefront was “abandoned” only after vigorous opposition by a precursor to Preserve Our Parks, the same people who still are working to protect the lakefront. Wonderful photo, thanks for sharing. I always wonder what kind of interesting intermodal station we could have at the lakefront still, had the CNW station been preserved. @Eddee The problem in my mind is that Preserve Our Park’s isn’t fighting to save our lakefront today, the fight is to save what are essentially two run down parking garages, that happen to have some grass on top. And in doing so potentially costing the city a very significant improvement to our tax base, new jobs, and yes quality of life. In addition to everything Dave said, Preserve Our Parks has destroyed their credibility in these fights of late. Instead of concentrating their efforts on preserving, maintaining and improving 95% of our wonderful but neglected park system, they have chosen to fight against developing a parking garage and what is now a highway interchange. What was once surely a useful group has now made it harder for the rest of us to fight for our entire park system. Thanks for the great photos! I used to work for one of Patrick Cudahy great granddaughters. She told me about those paths to the lakefront from her home, and how they used to have bonfires on the lakefront. Her house was THE Gothic one…it’s still there. Thanks @Mr Michael Horne! That is a huge flagpole! I agree with you about the cast iron fencing. That would be a great addition! Dave R., Milwaukee Art Museum, clearly an economic catalyst for MKE, depends on O’Donnell Park for its pedestrian access across Calatrava bridge and 60% of parking, per its director. The “public realm” also contributes to the tax base and quality of life. Dave, Preserve Our Parks is not fighting to “save” the Transit Center. They’ve stated that they support the Couture development and have proposed how it can be built without violating the Public Trust Doctrine, part of the state constitution. I did not know about most of their efforts because the all-volunteer group quietly pursues its mission. The Park People is somewhat more visible, has one staff person who coordinates all “park friends” efforts, projects like “”Weedouts” and donations to improve specific parks or the whole system. That group also opposes the sale and encroachment of parks.